Of the many design challenges for the quadcopter project I’m currently working on, figuring out how to enable the Netduino to control up to nine PWM outputs (for servo control) was certainly one of them. Fortunately, the smart folks at Polulu have created a handy micro-sized board to do just the job. One drawback is that servos tend to pull a lot of current, and I’d already fried my first Pololu control board due to a bit of over-zealous wiring. The trouble is, standard servo wire plugs combined power, ground and signal all into one neat package. This is great, if you are using your servos in a ‘normal’ way. However, mine are being driven under quite a lot of demand and through a Pololu servo control board, not an RX. In addition, as the power supply on the quadcopter is pretty punchy (60A!) and a little susceptible to temporary voltage drops or current peaks, I wanted to be able to provide a smooth, regulated supply to the Pololu itself, as well as the servos to which it is connected. 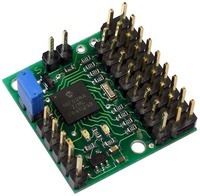 I want to split the three-pin output from the servo control board (the right-hand side of the image) so that a dedicated, high-current power supply can provide the power to each servo, yet enabling the signal to be driven by the control board. I’ve come up with what I believe to be a neat solution to this problem, as well as one that I haven’t yet blogged about: the need to create a power distribution board and sensor input board for each of the quadcopter’s many on-board sensors. My solution is based on the production of a custom-built Netduino shield, which combines two regulated power supplies and a ‘splitter array’ for separating power and signal from the servo cable, as well as space to mount the Pololu controller. In this way, the Pololu control board will be connected to the three-pin array in the centre of my shield. The signal pin will for each corresponding servo will then be connected to just the appropriate signal pin on the Pololu control board. Thus, a separate power supply for the servos is possible without any cable ‘hackery’. In this first revision, I have simply exposed the Netduino’s pins through the pin-compatible holes at the top and bottom of the board. It also features separate pins for D0+1 (COM1) and D2+3 (COM2), and solder pads for the high current power supply. 4600uF electrolytic capacitors are used to reduce noise and further stabilise the supply beyond the regulators as demand from the servos is likely to change very rapidly. 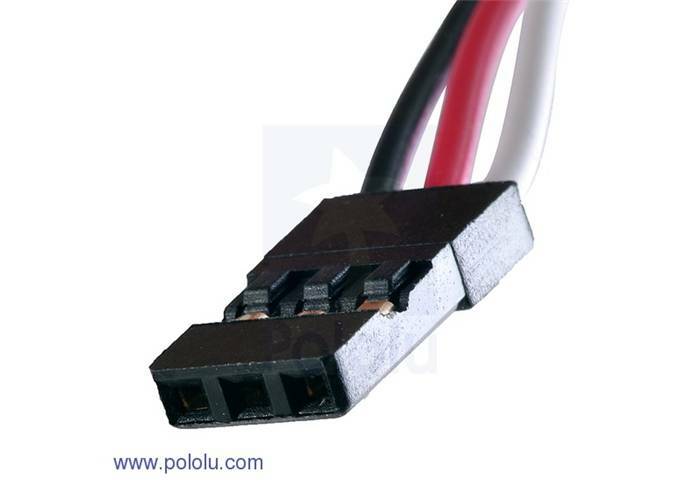 In addition, a 5V separate power supply is provided next to the splitter array to power the Pololu board. This board still needs quite a bit of work. Firstly, the silkscreen layer for the bottom row of pins hasn’t yet been added, and I may also actually breakout the pins into screw terminals to make it easier to hook up my various sensors to the board. If I go down this route, I’ll need to change the board layout considerably as I’ll need to preserve a 3cmx3cm area for the Pololu control board. I’ll also need to add screwholes (for my board as well as the Pololu, so that it can be mounted securely) and then finally, I’ll need to make one and check that it works as planned! 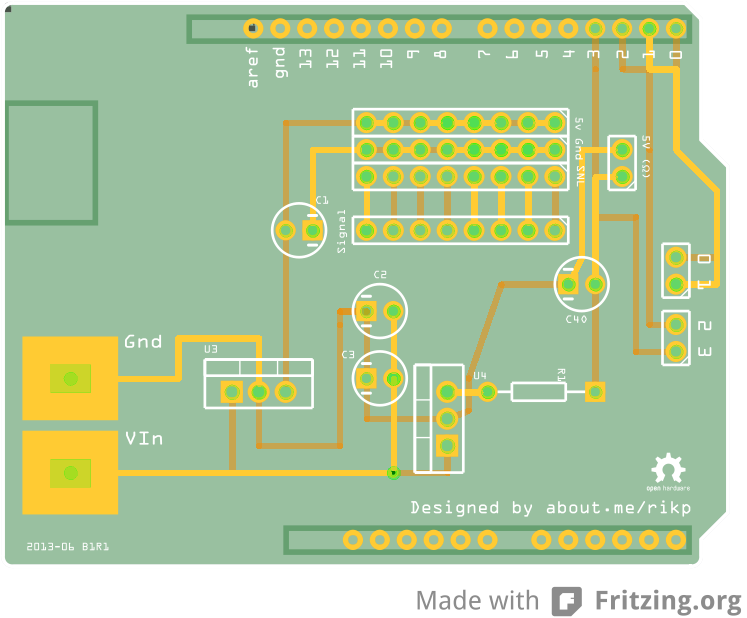 I plan to release the part to the Fritzing gallery once I’m happy with it, so that others may use it.